In the world we bank in today, customers don’t have a single destination for transaction, guidance and financial products. Their banking expectations are fueled by experience leaders across all channels - not just financial apps like Moven, Mint or Betterment, but also the likes of Amazon, Netflix and Uber. As one of the largest banking institutions in the world, Citibank saw the opportunity to fill this gap with Neo - a new digital-only branchless banking product targeted at acquiring new customers in the millennial age group. The vision for Neo is to seamlessly connect banking, guidance, and financial products with a leading customer experience that provides benchmarking, visual data, insights, spending and saving recommendations and personalized rewards. By improving people’s relationship to their money, Citi can help them know more, save more, and ultimately spend more. In order for Citi to sell the concept of Neo internally, we were tasked with designing the initial digital experience strategy and visual concept. 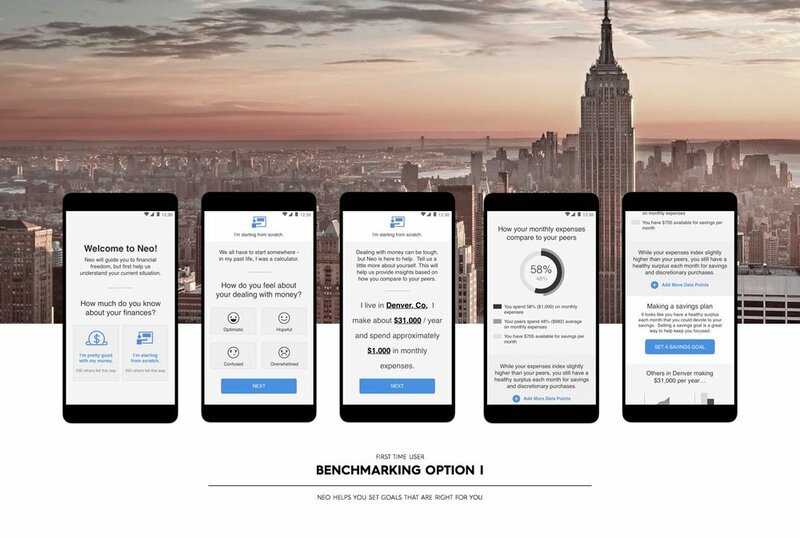 After weeks of gathering insights and defining the ideal core customer journey, we landed on these core features: benchmarking to see how you compare to your peers, goal setting, a visual dashboard, coaching, perks and celebration, and opening and funding your Neo Bank account. Once our core features were defined, we sketched and prototyped full user flows to test with the targeted demographic. To disrupt the banking competition, Neo needed a new and edgy look to appeal to the millennial target who is used to fun mobile apps like Snap Chat, Instagram, and AirBNB. This was accomplished using a unique and vibrant color scheme with sleek subtle gradients and a simple UI design system, helping them stand out from the competition.